Problem: Two hot dogs left in the refrigerator and four hungry family members to feed. Solution: Create a new, frugal recipe using the hot dogs as an accent for flavor. Our grocery budget this month is VERY tight because we paid $850 for our upcoming veggie CSA that will start in June and run through October. The CSA will save us money for sure, but this month, because we had to pay upfront, our budget is tight. But, as they say, necessity is the mother of invention, and this meal was a hit with every one except one of my children. Bring the beans to a boil for one minute in a pan, turn off heat, cover and let sit for 60 minutes. Put all ingredients including the beans in a slow cooker and stir until combined. 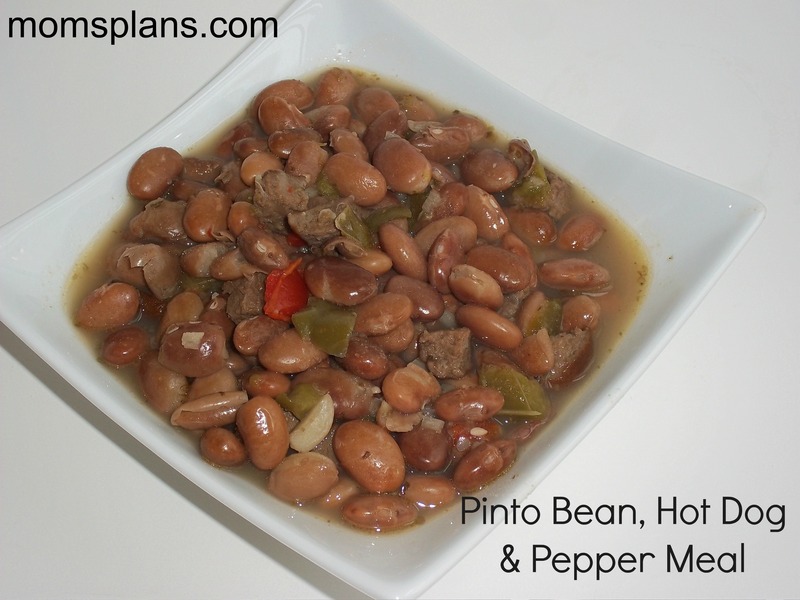 Cook on High for 3 to 4 hours or Low for 5 to 6 hours until pinto beans are tender. Which child didn’t like it? When I was a child, I hated beans but now since I’m an adult and live in Honduras, I love beans. I think I like refried the best but beans in soup type meals are delish. I hated beans as a kid, too. 🙂 I didn’t start liking them until I was in my 20s. Good on you! Scrimp a little now and enjoy the bounty of your CSA 🙂 Thanks so much for sharing this on Waste Not Want Not Wednesday, I’ve pinned it.